*From 23rd March 2019 places are only available on a waiting list basis, but there is another opportunity to perform this music at our Double Reed Day in Hampshire on Saturday 4th May 2019. 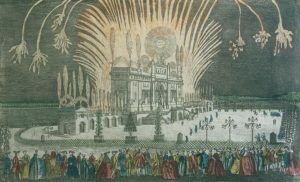 It was on 27th April 1749 that the ‘Musick for the Royal Fireworks’ composed by Mr Handel was first performed in Green Park in London. This was a major event in the city – even the rehearsal, held a week earlier in Vauxhall Gardens, attracted more than 12,000 people, each paying half-a-crown (12½ pence – just over £15 in current-day money value), and the event caused major traffic jams on London Bridge! If only classical concerts attracted the same attention nowadays – but this astonishing response was because the music was indeed the ‘pop music’ of its time. With our modern categories of ‘classical’, ‘pop’ and numerous other genres, this work is now firmly in the classical category, but it remains one of the most popular of all works from the baroque era. It is a major piece for double-reed players – the original performance featured 24 oboes and 12 bassoons (multiple players on each part), and the work is one of the earliest to incorporate the contrabassoon. 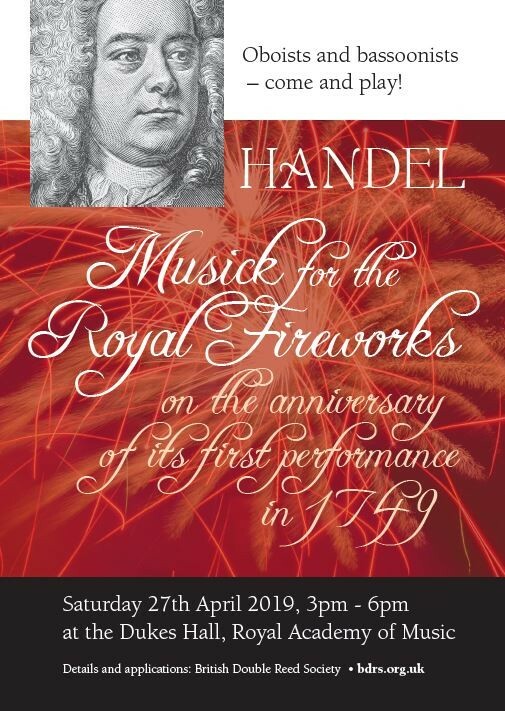 Exactly 270 years (to the day) after this legendary first performance, BDRS will be promoting a performance of this great music in London to commemorate the anniversary – and if you play oboe or bassoon, YOU could be a part of this historic event! 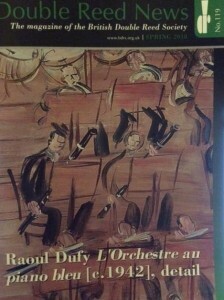 This will be on Saturday 27th April and it will be held in the Duke’s Hall at the Royal Academy of Music. There will of course be the original Handel oboe and bassoon parts, which are suitable for players of around grade 7-8 upwards, but if you are not quite at this level, you can still come and play. The performing edition which I have prepared for this from Handel’s original also includes some easier parts for players of between grades 3-6 standard. All parts will be put up on the BDRS website in March for you to download, print and practice in advance. This schedule enables players from many parts of the UK to travel and take part – the start and end times fit with train services to and from many destinations. Event fees: There are of course numerous costs involved in promoting an event of this kind, but we have kept fees down to a minimum – and interestingly, they are fairly similar to what people paid to come and listen in 1749! Application: You may apply but you will be placed in the queue on our waiting list. You will not be able to turn up on the day and play. There is an opportunity to perform this music at our Double Reed Day on Saturday 4th May, another opportunity to perform and join in! Please go to the menu options at the top of the BDRS home page, click on BDRS MUSIC COURSES and in the drop-down options click ‘Music Course Application Form’. Places on this event are limited by the size of the Dukes Hall platform, so book soon! Places need to be booked in advance – for security reasons, you need to be on the players list. If you turn up on the day without prior booking, you may not be able to take part – sorry! Updates: Plans and details are still evolving for this event, so please do keep a close eye on the BDRS website for updates and any possible changes. The one detail that will not change is the finishing time – it will not go beyond 6pm on that day. Be there! This is arguably one of the most important historical events in the calendar for oboe and bassoon players. It’s a fantastic celebratory piece to play, and will undoubtedly be a unique, special and very memorable day for everyone involved. So, make sure that YOU are a part of this! We are very grateful to the Royal Academy of Music Junior Department for kindly hosting this event. GDPR: The data we hold about you. The data we have is (a) your title, given name and surname (b) your postal address (c) your telephone numbers and email address(es) (d) an indication (if relevant) that you are under 18 years of age (but no other specific details such as date of birth, etc.) (e) musical details (the instrument you play, etc.) and other similar information (f) any other miscellaneous information that you have voluntarily sent to me in email(s) and via other on-line systems. We do not have your bank details, date of birth or other sensitive information of this kind. Also, we will not pass on your data to any other organisation, unless that is a necessary part of an entirely relevant process such as your application for a music course, where I need to send your details to the venue hosting the event. Our system is safe – All Membership details are stored on encrypted removable media solely for this purpose. 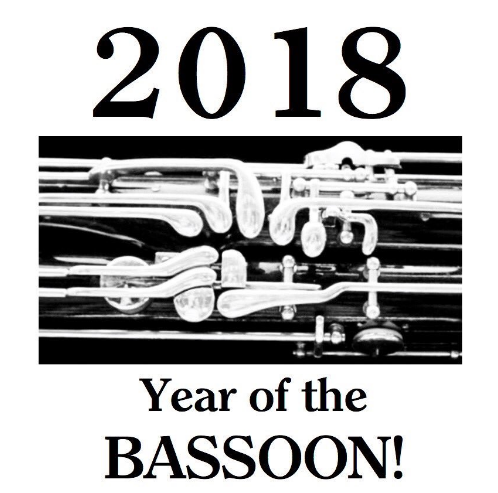 2018 is The Year of The Bassoon. 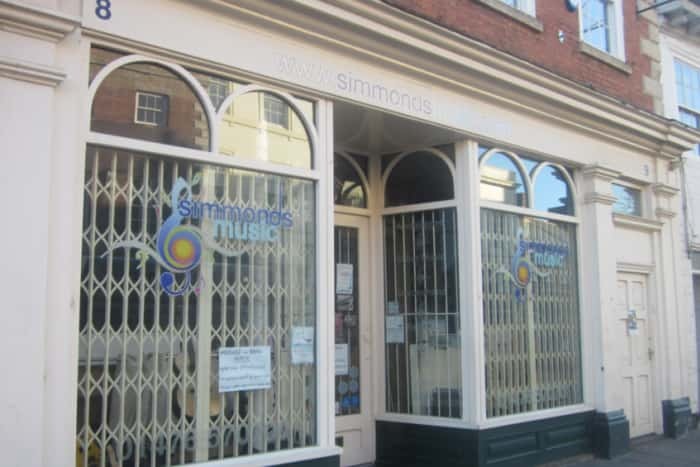 It is with great regret that we have to announce that bassoonist Tom Simmonds’ business, known as Simmonds Music in Grantham, has had to cease trading. Tom has suffered from a serious neuromuscular illness over the last two years and with that and a lack of footfall in the High Street he has been unable to sustain a viable concern. The receivers have been called in. Tom has been a staunch supporter of the BDRS for many years since he worked for John Myatt in Hitchen as their bassoon specialist. For further information go to this link to the Grantham Journal. We are very sad to announce that a former Chairman of the Society Anthony McColl passed away on December 21st after a short illness. He was for over thirty years the sub principal oboist at the Royal Opera House. He also taught for many years at Eton College. These were posts that he was so proud to have held and which he performed with grace and skill. His funeral service was held at St Barnabas Roman Catholic Church in Vine Road, Molesey at 1.30pm on Wednesday January 10th. It was a very well attended occasion including his brother Colin and a large number of family members. A younger relative Samuel McColl, played beautifully in part of Bach’s Partita No 2 during the service. 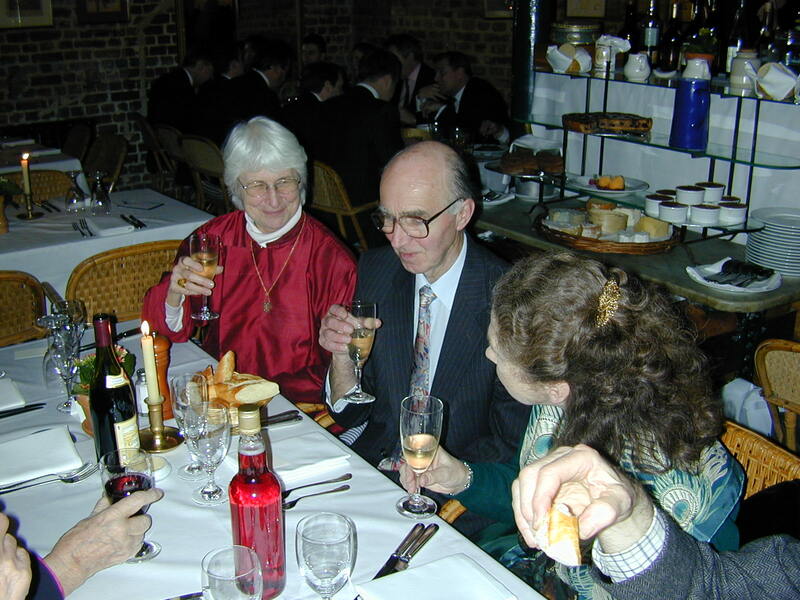 The oboe world was strongly represented, and amongst those with strong connections with the BDRS and the ROH, Celia Nicklin, David Presly, David Theodore, Graham Salter, David Thomas were there, also Deirdre Dundas-Grant – a former Chairman – and two former secretaries, Jefferey Cox and David Moore.